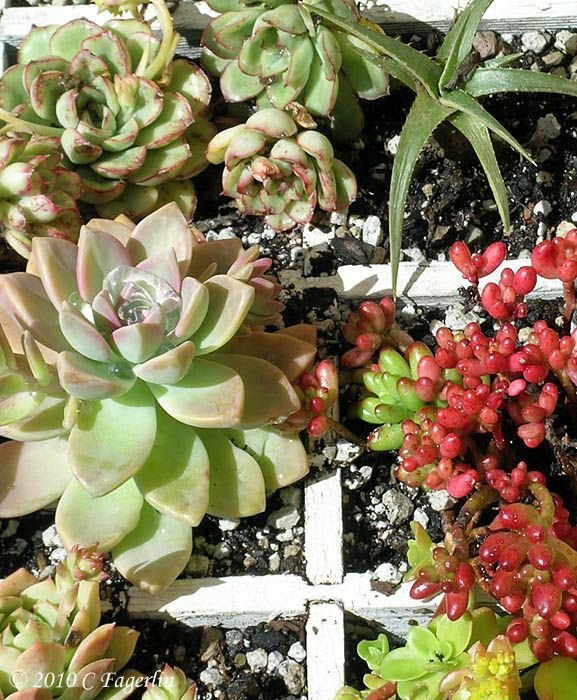 succulents in tiny pots to accomplish the same "look." offsets are added as space opens up in the nursery. again. Our official frost date is April 20th here in Zone 10B. prevent air flow and will cook all the little roots that you are trying to grow. of which worked equally as well in promoting fast growth for the kids. potting soil appropriate for succulents, which need good drainage. Add your plant and fill around the top surface with more moss. the pot, retaining the new root mass with the plant. surface adding moss if you want to, I left it off this year. will rot and die off over just a few weeks. 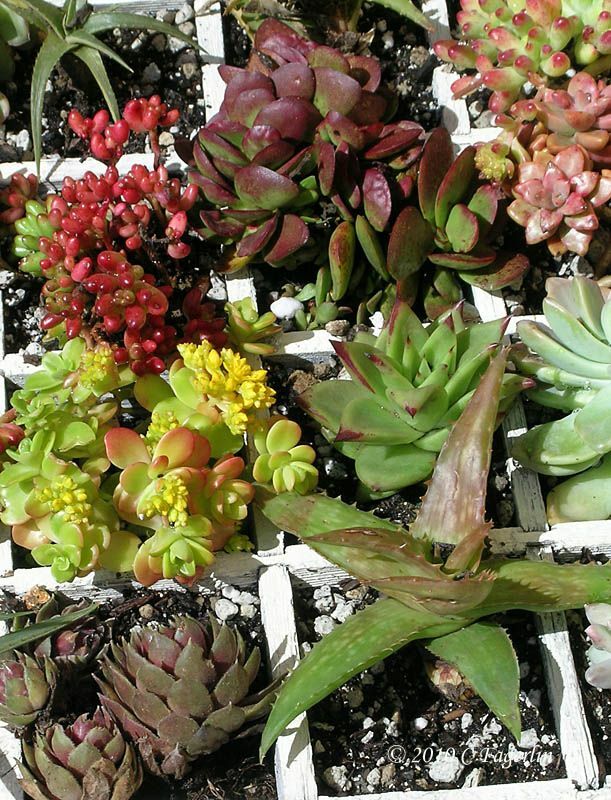 Give it a try, succulents are the easiest things to grow! I love all your wonderful succulents . This is just as cute as a button! 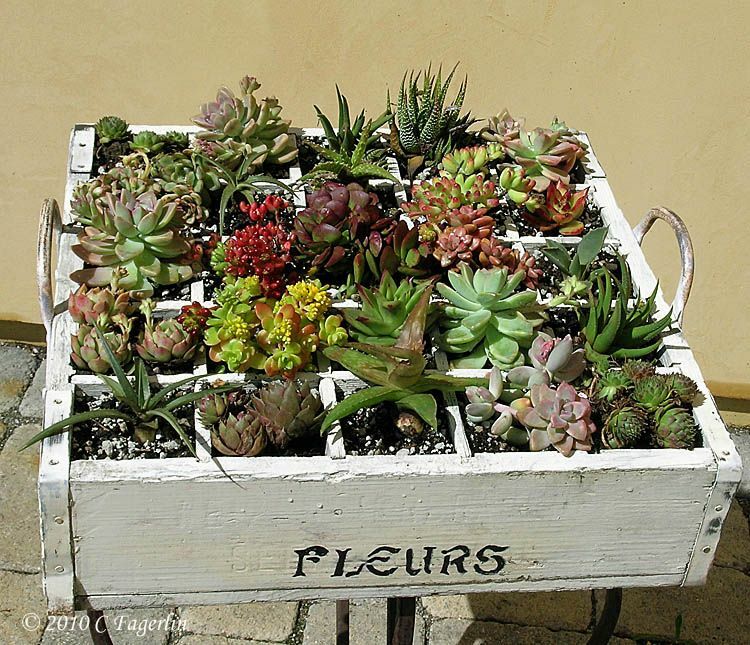 I put succulents in a birdbath last year, but I really like your crate idea. You have so many varieties. Stop by Applejack Lane if you have the chance. I am going to get some succulents and plant. They should do well in my area. Your plantings look so pretty. I'm glad those succulents have someone like you to watch after them! I LOVE this idea! 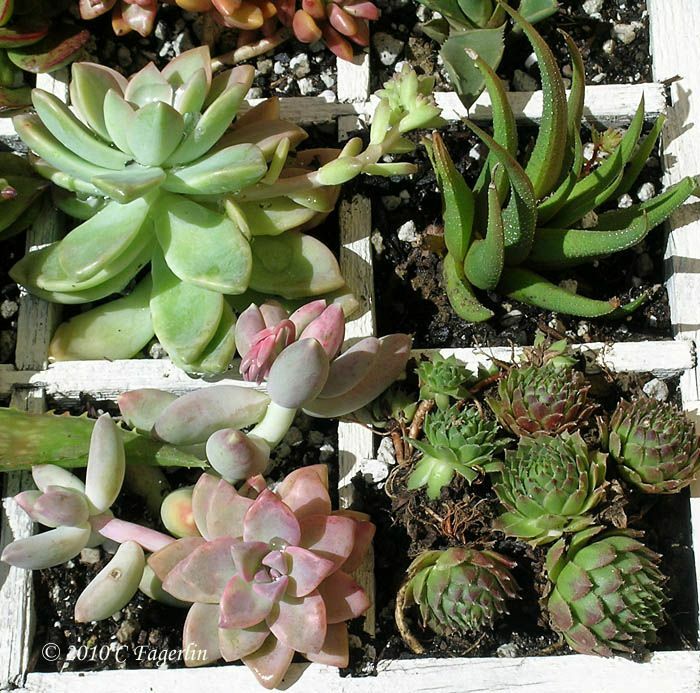 I don't have an old beer crate, but I am going to look for a crate to paint shabby white and fill with succulents! Thanks for the planting tip with the moss - I'll try it! They look so gorgeous in your photos. The colors pop and they're so healthy looking. A testament to recycle, reuse! This is a great idea and they look so happy. That's adorable - from the descriptions I couldn't figure it out, but then finally the pictures loaded on my slow dial up connection. I'm glad I waited! They look so gorgeous in that crate. They are so colorful and healthy. Very pretty pictures. Thanks for sharing! I'm just discovering succulents! I love how you planted yours in the crate. Thanks for the tutorial! 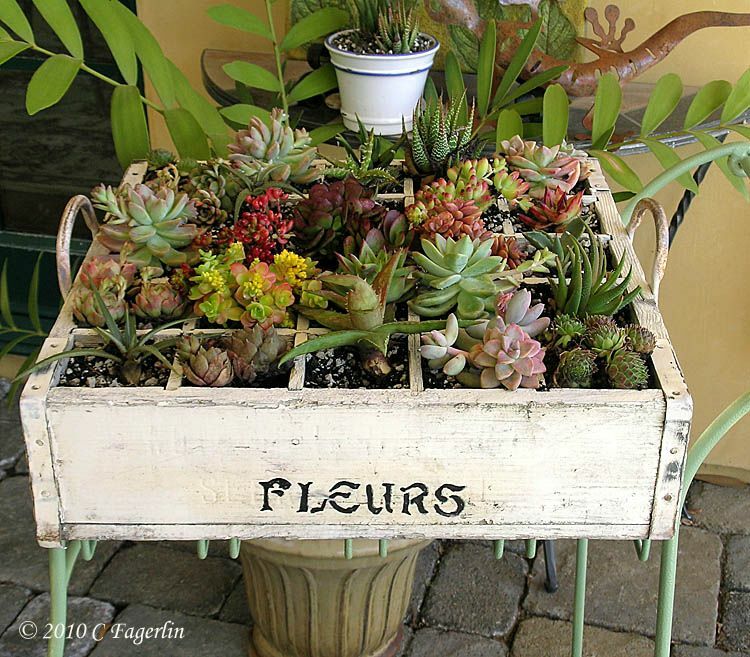 I love that box painted like that with fleurs on it and all those beautiful succulents. What a great post. I love how you have written about your little ones...love the NICU comparison. I'll bet you have quite a garden seeing how you lovingly take care of these guys. I so enjoyed reading your work tonight. Thanks for sharing! I really loved the whole arrangement. You have a marvelous touch. What a great selection! And loved the how-to because I am getting ready to pot a few varieties and don't have the greenest thumb. Lovely tea cart too! That is the cutest arrangement of plants in that beer crate. Good job! Come by my blog and enter for a chance to win Rachael Ray bake ware. It would look really great with your Fiesta. What a fun idea! So cute! Oh my that handled crate is to die for. You must be a great green thumb. Gorgeous plants too. My "fav" photo are the succulents in the cart. That is so pretty. Very creative and efficient. Succulents are so pretty to look at too. That box is great. I love the white. What a fabulous idea! I typically just reuse the little plastic pots to save the babies but this looks so much better. Thank you for sharing your tips with us today! Oh my! How much do I love this cart? 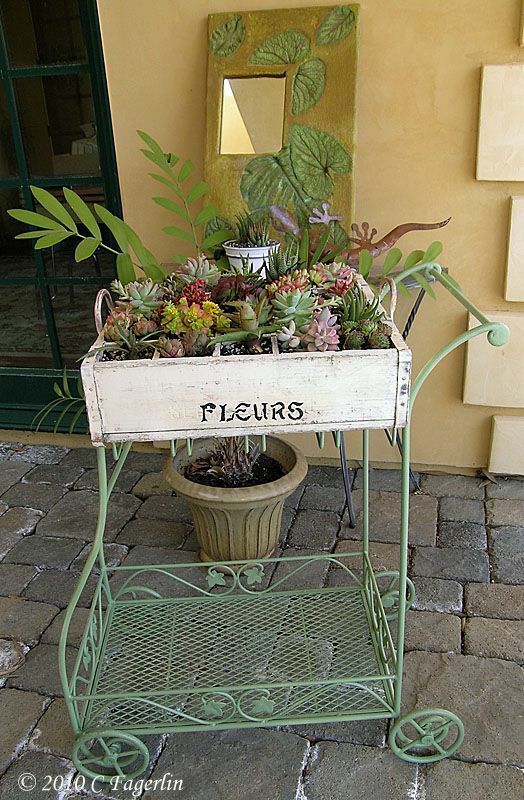 Adorable tea cart and you have quite the green thumb!! Gorgeous! 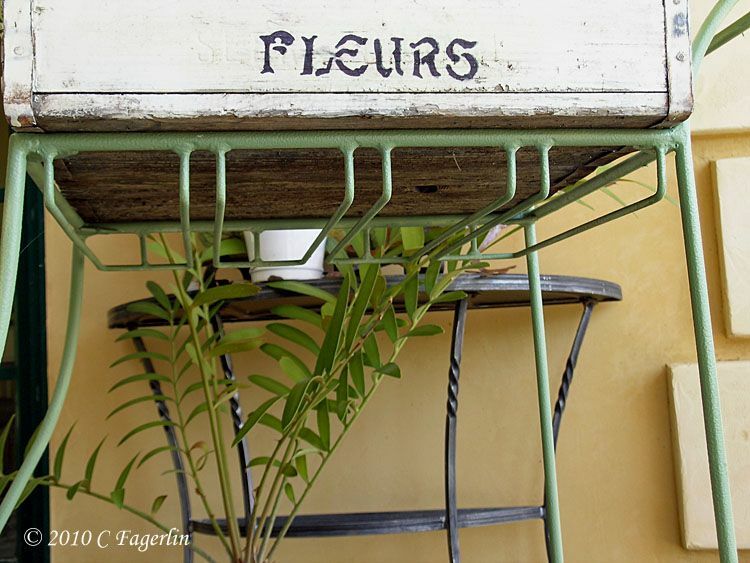 Love the contrast between your tea cart, that shabby fab growing box and your succulents. Hello to all you plant lovers! I'm so glad you stopped by to see the succulent NICU! These are such great plants and so very forgiving. I have had a lot of inquiries about the little tea cart. I've had it probably 15 years and got it at Pier 1 at the end of the summer season for $20! Too cute and it has served so many purposed over the years. Again, thanks to all of you for taking the time to stop by, the babies are available for viewing 24/7. Thanks for stopping by .... Spring is here in California! Spending more and more time outside and hope the same for you soon.